The PCC MatrixMIX Live Production Controller is designed for use with the AV Bridge MatrixMIX AV Switcher. 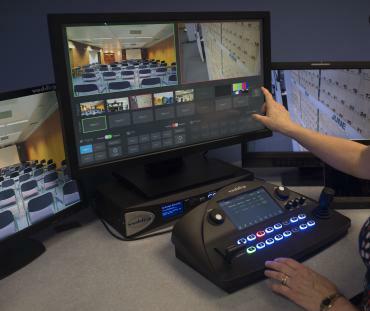 The PCC MatrixMIX integrates video switching, camera control, and graphics mixing into a single ergonomic user interface. The PCC MatrixMIX is equipped with precision controls for the most demanding camera operation environments. It has a full color touchscreen interface for easy-to-find camera functions, pan, tilt and zoom speed control knobs, illuminated push buttons for camera selection, large focus knob for fine control with auto/manual toggle and a three-axis Hall-effect joystick for smooth precise camera movements. All of these controls are browser-based and available through an embedded web server for control anywhere. 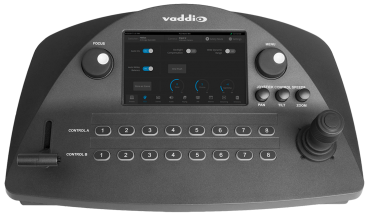 This broadcast-quality joystick controller comes with full preset store and recall, CCU functionality, and IP management for seamless control of any Vaddio RoboSHOT or ClearSHOT cameras –– from anywhere in the world. 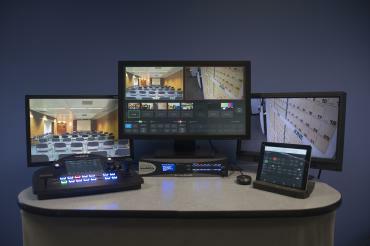 Whether you are creating a remote studio or state-of-the-art broadcast system, the PCC Premier is your solution to ultimate camera control.